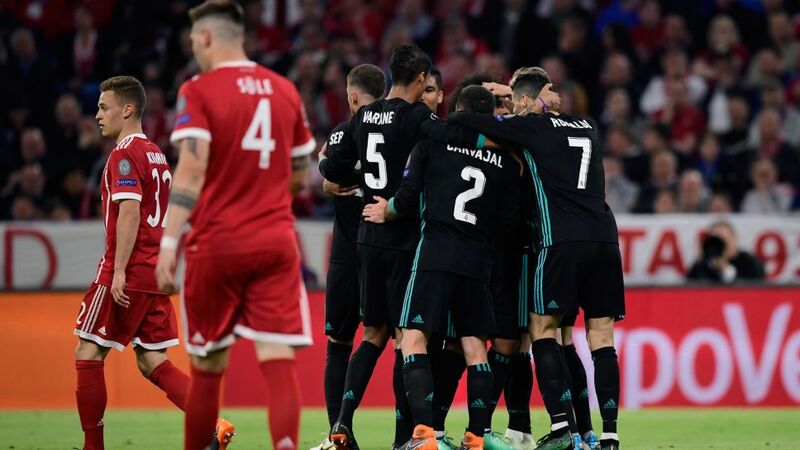 Bayern Munich were the better team against Real Madrid at the Allianz Arena, but they'll need a win in Spain next week after Marcelo and Marcos Asensio scored to drown out Joshua Kimmich's opener, giving the European champions a 2-1 first-leg advantage. Things did not get off to a good start for Jupp Heynckes' charges in the first half when Arjen Robben was forced off with an injury in the eighth minute of a full-blooded encounter. It was a tight affair until just before the half-hour mark, when Joshua Kimmich's excellent shot put Bayern in front, and Robert Lewandowski, Mats Hummels and Franck Ribery all missed further chances to add to the scoreline. Their misses proved costly, as Marcelo equalised with a fine shot from the edge of the box on the stroke of half-time. Bayern began patiently after the restart, probing for an opening, and threatened several times down the left wing through Ribery, who drew a couple of good saves from Keylor Navas. However, it was the visitors who scored next, with Marco Asensio finishing off a counter-attack to ruthlessly punish a mistake by Rafinha. Lewandowski should have levelled the score late on after an exquisite pass from Corentin Tolisso, but the Polish forward was uncharacteristically wayward with his finish, allowing Cristiano Ronaldo and Co. to return home with the advantage ahead of next week's second leg. James won the Champions League with Real in each of the past two seasons. Victory with Bayern would make him just the fifth player to win the competition with two different clubs in consecutive years, after Marcel Desailly, Paulo Sousa, Gerard Pique and Samuel Eto'o.Heynckes has reached the final in all three of his Champions League campaigns, winning the competition twice: with Real in 1998 and Bayern in 2013.As well as James and Heynckes, Arjen Robben and Kroos were up against their former clubs.Thomas Müller is two games away from his 100th Champions League appearance with Bayern. Only Philipp Lahm (105) and Oliver Kahn (103) have passed their century to date.In 24 previous head-to-head meetings, Bayern had won 12, Real 10, with the teams drawing twice. The German champions have won four of their last six semi-finals against their Spanish counterparts.Ronaldo is the top scorer in the season's competition with 15 goals, 10 more than Lewandowski. Both men are tied on 38 goals in all competitions in 2017/18, though. Watch: Every single one of James' Bundesliga goals and assists to date! Click here for more Bayern Munich news, view and features!